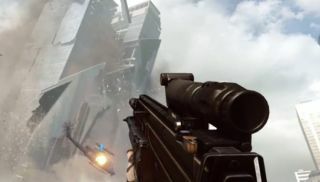 We've been flooded with gameplay footage of Battlefield 4 's singleplayer campaign, but there's been a distinct lack of anything multiplayer until today—the wait is finally over, as EA demoed the multiplayer at E3 with a bit of a scripted sequence involving the return of Commander Mode. I'm not sure why they've been hiding the multiplayer from us, because it looks amazing, with functional elevators, battles with helicopters in skyscrapers, and destructible environments taken to a new level. Walls, statues, windows, and buildings fall apart from the onslaught of the choppers and boats rampaging through the city. The video even shows a gunboat with jet skis attached as an escape mechanism. And then there's Commander Mode, which has been absent since Battlefield 2142 and is finally making its return in Battlefield 4. After being leaked in April , it makes a short cameo in today's video with an over-the-shoulder peek at the commander's interface. The tablet-toting commander sends a Tomahawk missile into an area tagged by a player, obliterating the group of enemies positioned there. For more Battlefield 4 news and the latest from E3, check out our complete coverage .